Benner, Steve M., Ph.D. Achaian League Coinage of the 3rd Through 1st Centuries B.C.E. [Classical Numismatic Studies No. 7]. Lancaster, PA and London, U.K., 2008. Hardbound with dust jacket. Contains viii + 188 pp., including concordances and indices. (GR326). The coinage of the Achaean League constitutes one of the final independent series in mainland Greece prior to the Roman takeover in 146 BC. As such, its issues reflect the League’s religious origin and democratic composition. Until now, Clerk’s Catalogue of the Coins of the Achaean League, published in 1895, and Thompson’s 1968 The Agrinion Hoard [ANSNNM 159] constituted the sole specialized studies of the silver issues. Warren’s recent The Bronze Coinage of the Achaian Koinon: The Currency of a Federal Ideal [Royal Numismatic Society Special Publication 42], while an important die study for the bronze coinage of the Achaian League, may prove daunting for the general collector. Steve Benner’s Achaian League Coinage of the 3rd Through 1st Centuries B.C.E. 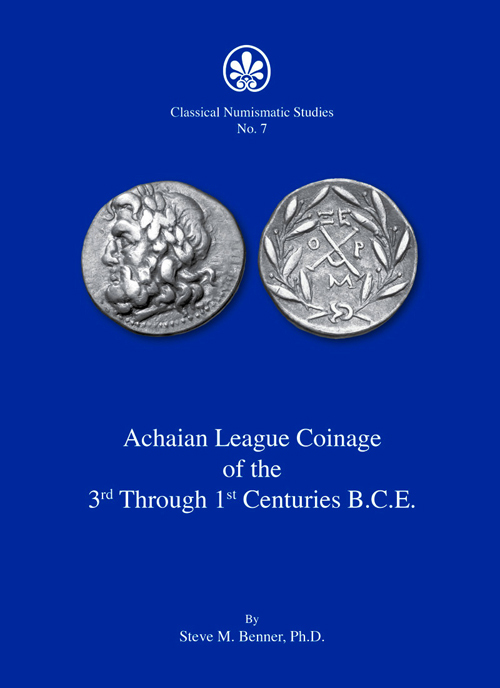 offers a systematic overview of the silver and bronze issus of the coinage of the Achaian League that will be useful for the general collector as well as the specialist. The book is divided into four parts. Part 1 provides a brief historical overview of the Achaian League from its earliest incarnation to its reconstitution in the third century BC down to its end in 146 BC. Part 2 introduces the Achaian League coinage, discussing issuing cities, chronology of issues, as well as brief excurses on points of typology and metrology. This section concludes with tables of issuing magistrates’ names and monograms present on the coinage. Parts 3 and 4 comprise the catalog of issues. Here, each entry provides all the salient information in a tabular format and is cross-referenced to Clerk, Warren, and BCD Peloponnesus (LHS 96). Appendices provide a quick reference for attribution of both the silver and bronze coins, as well as concordances to the major references. The book is supplemented with a bibliography, list of pertinent abbreviations, and is well-illustrated throughout. Achaian League Coinage of the 3rd Through 1st Centuries B.C.E. will be a useful inclusion into the library of any collector with an interest in the coinage of the Achaian League, the Peloponnesus, or Ancient Greece in general.